The links below detail a very unusual and interesting phenomenon. There has been a severe drought in Central Europe, and as it intensifies, river levels are dropping precipitously. The Elbe River, running from The Czech Republic through Germany, has dropped so low that dozens of Medieval “Hunger Stones” are now visible above the current water level. These “Hunger Stones” got their name from Medieval times when severe drought would lower river levels to the point food shipments and trade could not move along the river in sufficient quantities to avert severe hunger and perhaps even starvation. The local population would inscribe stones with new messages to mark the years whenever the river had dropped to levels that permitted previous hunger stones to appear above lowered water levels. Some of the hunger stones date to the years 1417 and 1616, and more were inscribed in the 1700s and 1800s. Some have a common theme: “If you see me, weep.” In other words, if the submerged hunger stones again appeared, it would signal to future generations that a time of such drought had arrived that hunger and possibly starvation was imminent. 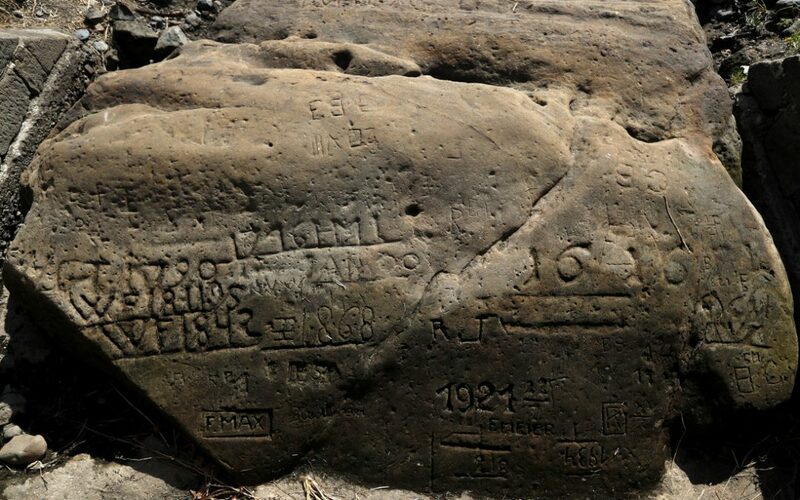 Inscriptions in the 1900s and later have also been inscribed, but they were less significant to people in the years after the Industrial Revolution due to food shipments no longer being dependent on just river traffic. The advent of railroads, cars, and roads, airplanes, etc. have caused enabled developed nations to be linked in a sophisticated food distribution system so that hunger and starvation do not result from regional prolonged droughts. The current drought is really very intense, and the second link mentions Germany, The Czech Republic, Hungary, Slovakia and Austria as nations most affected. It is not just the Elbe River basin that is affected. The first link mentions the Danube River has reached record low levels in a number of locations in Hungary, and the fifth link reported that the Rhine River reached such low levels this summer that barge traffic was barely possible. Perhaps more hunger stones will be revealed if water levels continue to drop. The second link mentions there are records of a hunger stone dating to the year 1115, but it has not yet been located. Bible prophecy has warnings that global food shortages are coming in the latter days. Matthew 24:7 warns that “famines” will characterize the latter days before the return of Jesus Christ, and Revelation 6:5-6 prophesies that global food supplies will be in short supply and rationed by price. In the first week of this month, I wrote a post (A Global Food Shortage Could Occur Quickly) which mentioned the above prophecies and it focused on how a super volcano could cause global food shortages in a very short time due to triggering cooler global temperatures because of volcanic ash and dust hurled into the upper atmosphere all over the world. This would cause the sun’s light to be significantly reflected into space and the cooler temperatures on earth would cause shorter growing seasons, earlier frosts, etc. This has happened before in recorded world history and its next occurrence would cause havoc in the global food distribution system as nations would be unwilling to export food elsewhere if their own food supplies and production were in jeopardy. This could lead to wars with nations fighting for dwindling food supplies. We take our modern civilization for granted, not realizing how tenuous it really is. Hard times will hit globally in a very sudden manner when/if a super volcano occurs. Matthew 24:7 also warns that “earthquakes” will strike “in various (or diverse) places” in the latter days. Volcanoes and earthquakes are both tectonic events so I believe volcanoes would be included in Matthew 24:7’s prophecy about earthquakes in the latter days, so a super volcano could be included as possible in that prophecy’s wording. I suggest readers review this previous post addressing how quickly food shortages could strike the entire earth if they have not already read it. We do not know when these prophecies will be fulfilled, but it is only a matter of time. For abundant evidence that we are living in the biblically-prophesied latter days, please read my article, Are We Living in the Biblical Latter Days?, and for a balanced perspective on how to prepare for the prophesied future food shortages to come, please also read my article, Should Christians Prepare for Future Hard Times? While the latter article is addressed to Christian audiences from a biblical perspective, its advice would be appropriate for people of any faith. My thanks to a reader for drawing my attention to this worthy story about the “hunger stones” of Central Europe.